Will Pfizer’s oncology business finally help the company grow its top line again? Pharmaceutical giant Pfizer (NYSE:PFE) recently reported its third-quarter earnings, posting decent bottom-line growth on a slight top-line decline. Shares of Pfizer barely budged after its earnings report, although the stock remains up more than 20% over the past 12 months and currently sits near its 52-week high. The story of Pfizer is a well known one -- for several years it rode high on the success of Lipitor, its blockbuster cholesterol drug that once had peak sales of $13 billion. When Lipitor's patent expired in 2011, it left a gaping hole. Pfizer quickly responded by cutting costs, downsizing its operations, and selling and spinning off non-core businesses. As a result, Pfizer preserved its bottom line even as its revenue fell -- an impressive feat that convinced shareholders to stick with the stock, and shares have risen more than 40% over the past two years. Although Pfizer has proven its ability to preserve its bottom line, it hasn't yet shown that it can grow its sales. Therefore, let's take a closer look at Pfizer's efforts in oncology, which could be the key to unlocking the company's ability to grow its top line. For its third quarter, Pfizer's earnings rose 16% year over year to $0.58 per share, but its revenue declined 2% to $12.6 billion. Sales fell for the usual reasons -- a 59% year-over-year decline in Lipitor sales, which only came in at $78 million during the quarter, and the termination of collaborations for the respiratory drug Spiriva across several regions. Source: Pfizer third-quarter earnings report. The rest of Pfizer's sales growth was mixed, but the 24% growth in its oncology segment stood out above all the rest. Although the oncology segment only accounts for 3% of Pfizer's revenue, there are several rapidly growing products in its oncology portfolio, which could boost the segment's importance over the next few years. Pfizer's two fastest growing oncology products are Xalkori and Inlyta. Sales of Xalkori, its treatment for non-small-cell lung cancer, or NSCLC, rose 92% year over year to $73 million. Sales of Inlyta, a late-stage kidney cancer treatment, rose 186% to $83 million. There are several established NSCLC treatments currently on the market. The most common are Roche's Avastin and Tarceva, AstraZeneca's Iressa, and Bristol-Myers Squibb's (NYSE:BMY) Erbitux. However, Xalkori is intended to treat a specific mutation, known as ALK, which only affects approximately 4% of NSCLC patients. During clinical trials, Xalkori was shown to be effective on over half of tested patients, which led to its FDA approval in 2011. Xalkori is currently the only approved treatment for ALK-positive NSCLC, and is often used as a first-line treatment prior to chemotherapy -- which gives it a comfortable niche. Inlyta, on the other hand, faces competition from Nexavar, one of the most widely used treatments for late-stage kidney cancer and advanced liver cancer. Both Inlyta and Nexavar are generally used as second-line treatments for that indication. Nexavar was co-developed by Bayer (NASDAQOTH:BAYRY) and Onyx Pharmaceuticals (now part of Amgen (NASDAQ:AMGN)). However, Inlyta's triple-digit sales growth shows that it could actually overtake Nexavar, which generated $288.4 million in revenue for Onyx in 2012. However, Inlyta is not the only kidney cancer treatment Pfizer has in its oncology portfolio. Sutent, an older cancer drug approved for rare types of stomach and pancreatic cancer, has also shown promise in clinical trials as a first-line treatment for late-stage kidney cancer. If approved, the competitive field will be fairly narrow -- GlaxoSmithKline's Votrient is the only other major drug currently recommended as a first-line treatment for late-stage kidney cancer. Sutent generated $278 million in sales during the third quarter. However, sales declined 5% from the prior year quarter, indicating sales might have already peaked. From the following chart, we can see that Xalkori has the highest growth potential. Sources: Pfizer third-quarter earnings report, industry websites. How do these drugs fit into Pfizer's future? Of course, Pfizer's oncology portfolio is still a small piece of the puzzle. For these treatments to make a meaningful impact on Pfizer's top line growth, two other non-oncology drugs -- Xeljanz and Eliquis -- must live up to their full potential. Xeljanz, a new rheumatoid arthritis treatment, only generated $35 million in revenue during the third quarter, but analysts believe that it could eventually generate between $1.6 billion to $3.0 billion in annual peak sales. The reasoning is simple -- the market for rheumatoid arthritis treatments is huge, dominated by blockbuster treatments such as Johnson & Johnson (NYSE:JNJ) and Merck's Remicade, AbbVie's Humira, and Enbrel, which Amgen co-markets with Pfizer. On Pfizer's side, Enbrel sales rose 4% year over year to $932 million during the third quarter. Meanwhile, Eliquis, a new blood thinner that Pfizer co-markets with Bristol-Myers Squibb, could eventually generate $4.2 billion in annual peak sales. However, blood thinners are a fairly crowded market, and one that could favor established drugs such as Bayer and Johnson & Johnson's Xarelto and Boehringer Ingelheim's Pradaxa, which both arrived earlier than Eliquis. 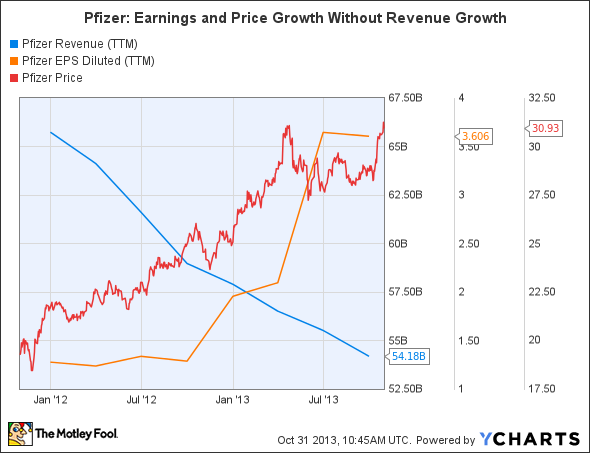 In a nutshell, Pfizer's future revenue growth is anything but guaranteed. While the peak sales estimates of Xalkori, Xeljanz, and Eliquis are impressive, their current sales numbers are not. Since Xalkori focuses on such a narrow group of NSCLC patients without any meaningful competition, it should have the least trouble taking off. Meanwhile, I'm less certain about Xeljanz and Eliquis, which are entering saturated markets much later than competing treatments. Nonetheless, investors should remember that Pfizer is very skilled at preserving its bottom line along with its forward annual dividend yield of 3.1%. Therefore, it's unlikely that Pfizer will collapse any time soon simply because it is still struggling to grow its top line.